Most people have traditional printers in their homes. They’re essential. It’s not like you use your traditional printer every day, but when you do need to use it - maybe you need to print a document or a prepaid shipping label - you’re happy that you have it. It saves you time and money. A decade ago, 3D printers weren’t in the public eye. Today, models exist that almost anyone can afford. It’s the same concept as a traditional printer - when you need to print something, you’re ecstatic that you have the capability. 3D printers are so, so much more than that, though - you can print entire items, not just paper. It’s like something straight out of a science-fiction movie. 3D printers have come remarkably far in the past couple of years. Back in the day, they were similar to computers in the 1980s - bulky, clunky, and not that powerful. Today, they’re like the newest Macbook - sleek, easy-to-use, and ridiculously efficient. The first step is getting the design for your object. If you’re the engineering type, you can create these yourself with a program like AutoCAD. The rest of us can buy an already-made design - they’re relatively cheap, and engineers have created them for almost anything. You can go on a site like Shapeways right now and see what’s available. The second step is getting the material for the object. Let’s continue on the trend of paper clips - if you want to print some simple plastic paper clips, all you do is select plastic as your material. Different printers support different materials - almost all 3D printers come with the materials included. The third step is printing. I won’t bore you with the exact science behind it, but once you press the print button, all you have to do is relax and watch as your real-life items are printed in front of your eyes. It is science - I promise - but it looks exactly like magic. What’s the point of having one in your home? Can you design it? Great, then your 3D printer can create it. The beautiful thing about 3D printers is that they can be used for almost anything. Sure, you can print everyday items like paper clips, but you can also do so much more. You can create iPhone cases. You can create children’s toys. Heck, you can even create fully functional mini cars - that’s what they did in Skyfall. Board games. Lamps. Let’s see… jewelry. Artwork. See where we’re going with this? As long as it can be made from plastic, you can make it with a 3D printer. Ready to make the leap? I don’t blame you. They’re fun to play around with, and it’s always cool to have the newest piece of technology before it truly enters the public eye. That being said, there are some things to take into account before making the purchase, or even searching for models to consider. 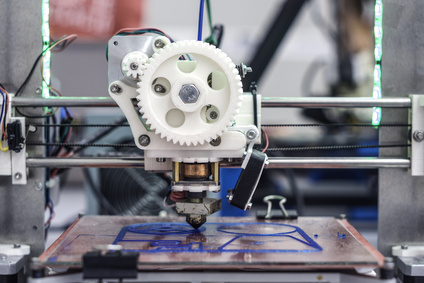 Because 3D printers are usually made for industrial-scale operations, you don’t have that many buying options… unless you’re looking to go over $2,000. Under $2,000, you can get a basic one for around $200, a “pretty good” one for around $500, and a really good one for around $1,000. Past that, you start adding nifty features, but with those features comes an increase in price. What do you need to print? Different 3D printers can print different things. Duh. But really take into consideration what you want to be printing. If you want to be printing plastic, metal, and glass, then you have to go for a really high-end 3D printer for your home. If you just want to see how it works, you can get away with a bottom-tier 3D printer that only does small plastic figurines. I personally recommend something in the middle - it’s good to learn on, and once you do, you can move onto somewhat useful prints. Do you have design knowledge? Some printers are made for the engineering grads, and some are made for the everyday hobby enthusiast. If you went to school for engineering, then you can stick with a bare-bones machine. If you don’t have the knowledge, save yourself some trouble and get a beginner one - the learning curve on complex 3D printers is steep, even if you’re using it at home and have all the time in the world. This is a big one. Most 3D printers do not come assembled - you merely get the parts, and then it’s up to you to figure it out on your own. If you’re not a handyman, go for a pre-assembled one, or at the very least, one that’s simple to set up. The last thing you want to do is drop a substantial amount of cash on a 3D printer for your home and not be able to use it. You have two options - buying in-store, or buying online. If you head into certain Best Buys, you’ll be able to see one or two 3D printers for sale. Here’s the problem, though: the only 3D printers that Best Buy sells are the ones that cost an arm and a leg. Remember, they have to not only sell an expensive printer, but also mark it up so that they make a profit. That’s why I recommend shopping online. You can find every model that you’d see in-store, and a 3D printer isn’t like a piece of clothing - you don’t have to actually use it to know what it can do for you. So take a look around, find one that you like, and pull the trigger. Once it arrives, you’ll have a machine that can create objects out of thin air. And I think that’s cool. What the heck are 3D printers used for?